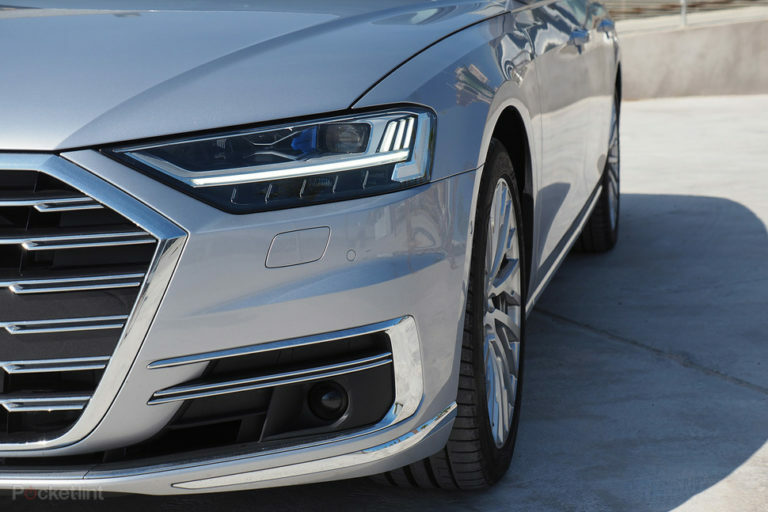 Step into the brand new Audi A8 and it’s impossible not to be impressed. This car is like a first class suite on wheels, with such an abundance of tech on offer that it’s hard not to play with every touchscreen and option for the sheer thrill of what’s possible. But while Audi is adamant that the A8’s exterior design represents a huge shift for the brand, to our eyes it’s visually much the same as Audi’s current saloon lineup. It’s got that quintessential ‘Audi look’, which some would call bland, others elegant. Whichever side of the design fence you stand, it’s this car’s systems that bedazzle. From level three autonomous driving – which we’ve previously tested on the road in Germany – to self-parking via the press of a smartphone app button, the A8 certainly has its eyes on accelerating us into the future – but in the here and now. Add an abundance of interior niceties, such as considerable control of systems from the car’s rear seats via removable centre touchscreen, plus a swathe of safety features, and the A8’s futuristic appeal has the gumption to surpass the formidable BMW 7 Series in the executive saloon space. 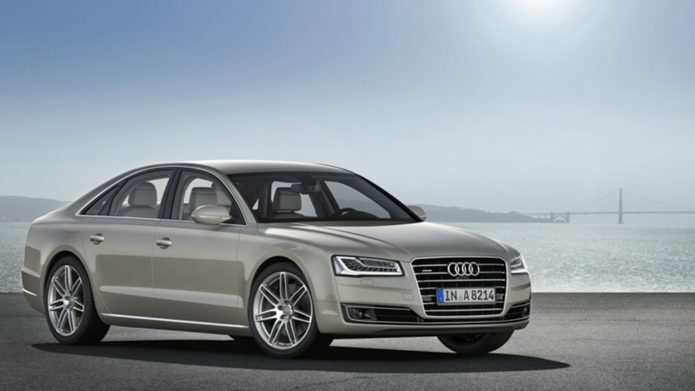 The Audi A8 is a big deal for the German brand. Since new design boss, Marc Lichte, took the reins in 2014, the shift in design has been towards a sportier, slightly meaner aesthetic. But only by a little: the new A8 doesn’t look dramatically different to the outgoing car; it’s in the forthcoming A7 that we’ll see a more dramatic change. As a result the 2017 A8 looks familiar, albeit with some notable new touches. The front matrix headlights add some sharpness to the slightly rounded nose, while the front grille’s extension towards the wheel arches gives that slightly more aggressive look. To the rear the wrap-around light bar has a sense of Porsche about it, while newly positioned OLED panels (as extras to the main light – they’re not bright enough to be road legal) add animations and some pizazz to proceedings. There’s credit in what you can’t really see, too. The new A8’s platform is wider and flatter than the outgoing model, designed to integrate with Audi’s fully active air suspension for added comfort and safety (more on that later). Open the driver’s door – which auto-raises the car’s height using the air suspension for a more comfortable entry, a very visible-to-see and oh-so-fancy feature – and there’s no denying the A8’s explosive interior design. There’s the “status and prestige” stuff, like open pore ash veneer and organically tanned leather – but you’ll almost bypass those (admittedly lovely) touches given the understated dominance of the new digital dash. Which is a justified oxymoron, given just how well integrated and hidden the abundance of tech is when the engine is switched off. The A8’s dash wraps its way around the full width of the car, almost floating in its position, while two large touchscreen panels are neatly integrated to the centre tunnel. Everything appears as one single piece, removing the smattering of knobs and buttons found in the A8 of old. “Reduction becomes a new feature of Audi design,” says the company – which certainly rings true. Even the air conditioning vents are hidden from view, revealing themselves by electronically motoring their covers out of the way. 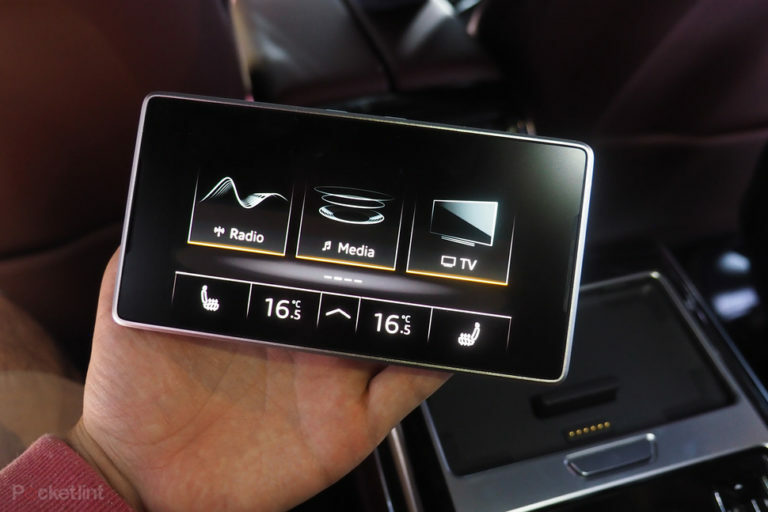 Which makes for a dramatic shift in the way Audi MMI operates, other than the digital Audi Virtual Cockpit display behind the driver’s wheel, anyway. When we first saw the system at the A8 unveil, we were impressed with how considered some of the small but important touches were. The haptic and audible feedback from button presses, for example, is the most truly button-like sensation we’ve felt from any touchscreen surface – be that phone, tablet, car, or anything that’s passed through the office. 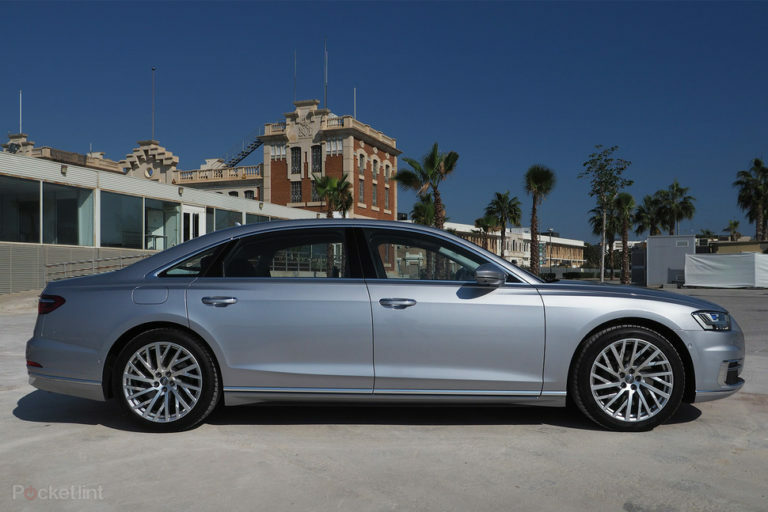 Problem is, with our eyes fixed on the road, meandering the long wheelbase A8 L through Valencia’s mountain roads, there’s limited immediacy to where various controls are. There’s no physical dial to make temperature adjustments, it’s a +/- or slider on the lower screen, which is fiddly from a driver’s point of view. And there’s so much on the upper screen – Radio, Media, Navigation, Messages, Car, Telephone, Settings, Phone Apps – that it simply gets too busy to quickly tap, without becoming distracted. Some key functions – Drive Select (for Auto, Comfort, Sport and Individual), traction control, hazard signal, and front/rear demist – permanently exist on the lower section of the touchscreen, ensuring you’ll learn where they are. Even so, the smooth screen surface makes hitting the Drive Select up/down arrows more of a fiddle than we’d like – some sort of raised surface or texture would be better. 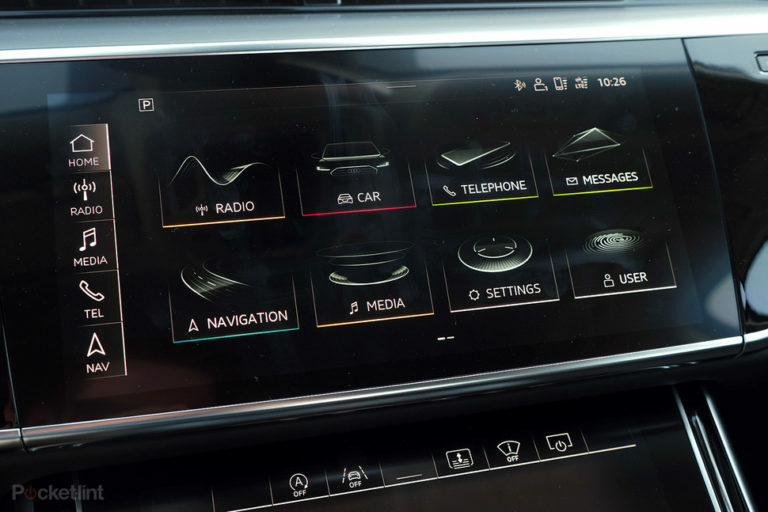 It’s not our imagination that largely touchscreen systems can’t integrate physical controls better – just look at the Range Rover Velar and its Panasonic-sourced system. There are some thoughtful touches in the A8 to counteract your eyes departing the road for too long, however, so long as you put the time in prior to set things up to your personal needs. Press-and-hold a given icon, for example, and you can drag it into a side panel as a favourite, for quicker and easier access. That might be a favourite radio station or setting, cutting out the click-through and search process. Additionally, the A8 isn’t completely bereft of buttons or knobs. In addition to a passenger-sided volume knob, there’s a trio of flush buttons next to the lower panel, used for parking assists and Audi AI (for forthcoming Audi Traffic Jam Pilot – it’s not actually a button just yet, given the tech won’t arrive for the car’s on-the-road launch). The safest car on the road, ever? It’s those parking assist features which bring us neatly to the A8’s safety systems, of which there are a stack. And then some. It’s not all parking, either. 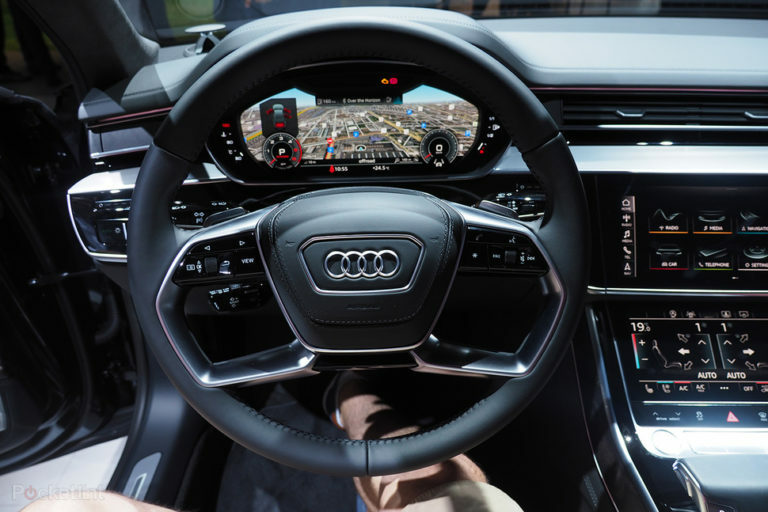 Sure, the 360-degree camera of Audi AI Parking Pilot – which can depict a frightfully accurate 3D model on the screen and can be rotated using the touchscreen – is useful for parking such a long vehicle without smashing into the kerb or surrounding vehicles. 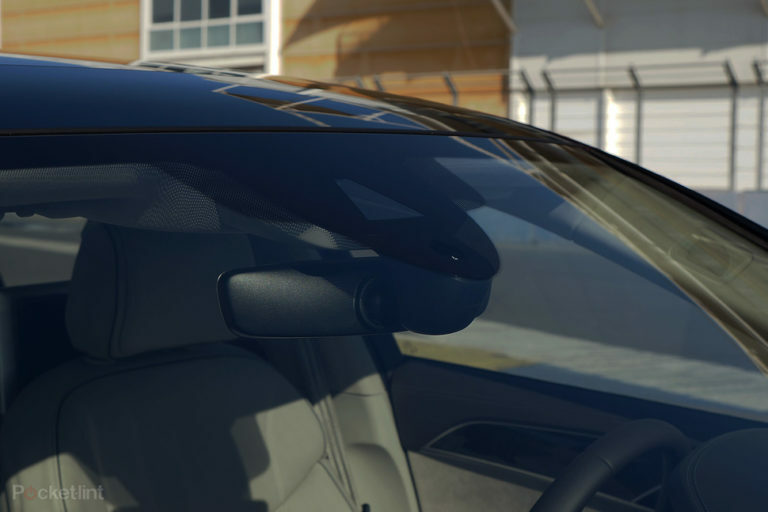 But you needn’t necessarily use such a feature when behind the wheel: the AI Remote Parking Pilot means you can simply press-and-hold a button on your smartphone and, when standing outside the car, watch it park itself into a bay (reverse of parallel park) or into a garage. That’s assuming your garage is large enough to accommodate an A8 — this isn’t a compact saloon. But it’s awe-inspiring to watch the car literally drive itself, like there’s a very proficient parking ghost behind the wheel. This is all thanks to a stack of sensors on board, as part of the zFAS system. Twelve ultrasonic sensors, four 360-degree cameras, five radar sensors (four mid-range, one long-range), one laser scanner and one infrared camera enable the car to be always looking at its surroundings. Which isn’t just useful for parking situations. Audi AI Traffic Jam Pilot, for example, can maintain lane, stopping distance and stop/start at up to 60kph (37mph, UK-ers), without you needing to, well, do anything at all. 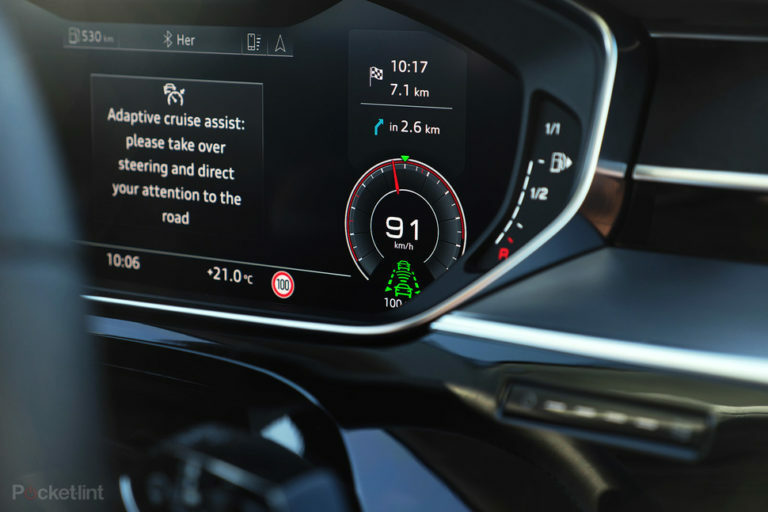 Even beyond such speeds, the system has active lane keep assist which will automatically turn the wheel and drive the car along happily – so long as it can detect your hands on the wheel, otherwise it will force a handover (see, it really is always watching). This is all down to those sensors gathering data and constantly working it. The position of such sensors assists with avoiding potential incidents too. The infrared camera can detect pedestrians and wild animals at long distance and adjust accordingly. Laser spot beam activates when exceeding 70kph, to double length of vision (this won’t make it to the US, as there’s no manual override). The wide-angle cameras can see oncoming traffic around difficult corners and auto-brake to avoid collisions. The electronically controlled doors will even put on a half-second pause if there’s a cyclist approaching from behind that you haven’t seen. There are in excess of 40 driver assist features, which makes it almost too many to mention – so you can be safe in the knowledge of being in one of the safest cars on the road. That’s something more typically representative of a brand like Volvo. And should the worst happen then Audi AI Active Suspension can assist too. We tested a theoretical side-on collision (a reinforced glass plate stopping actual collision with the car), which sees the car rapidly auto-raise by 8cm on the collision side, while tightening passengers’ belts in tandem to reduce the potential of injury. All of that is certainly interesting but, let’s face it, the A8 is designed as an executive saloon, in other words the most important people will end up sat in the back, being chauffeured around. And it’s here where the A8 is arguably as its best. Comfortable leather seats, oodles of legroom and a Rear Seat Remote allow those in the back to take command of many comfort systems. Plus there’s optional mood lighting and something called a Remote Seat Entertainment system with detachable tablet screens like you’ll find in a Bentley (but only if you pay for that option – as with so many of the features found in this Audi). All ensure the new A8 is a Tardis of tech and comfort. The Rear Seat Remote is the most interesting of these features: it’s not a simple handheld remote control, as its name suggests, rather an 8-inch touchscreen panel that’s found in the centre armrest. Only it’s not fixed in place – a press of the release button detaches it to be handled from the lap for extra comfort. Without the need to look at the road as a rear passenger, this touchscreen remote works exceptionally well. Whether you want to adjust the mood lighting, control the stereo, climate controls, personal lighting (the directional LED lights can be adjusted for precision), seat heating, or much more – it’s all available at your fingertips. Neighbouring physical seat controls mean the front passenger seat can be moved right forward (so long as there’s nobody sat in it), for considerable legroom, and even a foot massage panel. How’s that for hyper-comfort? Ok, so not one word, more like a lot of words on price. Let’s face it: the new A8 was never going to be a pocket change kind of car. The outgoing car started at around £65K, while the 2017 model was rumoured to be much more – in reality, it’s not, starting at £69,100. Take that starting price with a pinch of salt, however, as Audi is big on options, many of which are exactly what transforms the A8 from nice car to true luxury car. On the base spec, however, you do get those comfortable seats and heaps of space, plus the impressive touchscreen dash. Want the Bang & Olufsen 3D soundsystem (which is incredible, by the way)? Add £6,350. Matrix LED headlights? Add £4,900. The panoramic sunroof is £1,600. Assist features can also add extra cash to the tally: City Assist is £1,375; Safety Pack £450; Night Vision Assist £2,200. Sadly the Rear Seat Remote isn’t included, adding an extra £500. The rear Matrix LED lights are £250, too. We knew the Rear Seat Entertainment screens would add to the price, but at £3,050 it’s no small addition (and Digital TV reception is an extra £1,250 on top). There’s a lot more that can be upgraded, too, much of which we think is “because you can” rather than essential. The full leather pack is £1,000/£2,350, depending on how much cow hide you want. And if you’re feeling especially excessive then the ceiling can be lined with Alcantara for an extra £1,550. All in all, then, you can easily double the on-the-road price. Which, frankly, is no surprise for an Audi. Our test car, therefore, came in at almost double its base price, at circa £110,000. It’s a lot of cash, but as you can tailor what you want on board, a sub-£100K price tag is feasible and, frankly, around the ballpark of where we expected this car to sit. Best get that bank loan sorted then, eh? It’s a rare thing to arrive at the verdict of a car review and have barely touched upon the vehicle’s on-the-road ability. Clue: it’s fast, in 3.0 litre diesel or petrol V6 engine options (no V8 for Blighty), with some expected wallow from that large body when pushing things. An e-Tron plug-in hybrid will follow, along with a 6.3 litre W12 model. But the drive is almost secondary in the A8, because it’s such a haven of tech, assist and safety features that, as an executive saloon, it perfectly hits the nail on the head for its passengers. That makes it a bold step forward that successfully takes on the likes of the BMW 7 Series and Mercedes S-Class, no question about it. Ultimately, the new Audi A8 is a vision of in-car tech’s future. In that respect it is visionary in pushing the envelope. In the same breath, however, not all of those touchscreen controls make it perfect to use from a driver’s perspective while out on the road. But as a passenger in the back? Well, in the rear right-side seat with the massage chair on we can’t think of a luxury saloon we’d rather be sat in.